One of the new features in Final Cut Pro X (v.10.3) is the ability to import iXML audio data and assign it to individual channels in the audio file. If you are doing productions where you are recording multiple microphones at once and your recording mixer supports iXML data, this can save a lot of time in the edit in keeping track of who is recorded to each audio channel. But, before we discover how this works, let me explain what iXML is. NOTE: iXML supports audio files only; requiring, in almost all cases, files recorded double-system to stand-alone audio field recorders. “iXML is an open standard for the inclusion of location sound metadata in Broadcast Wave audio files. This includes things like Scene, Take and Notes information…. It is designed to standardize the exchange of metadata between these systems. “Following initial discussions between Mark Gilbert of Gallery, John Ellwood of SynchroArts and J.P Beauviala of Aaton at the IBS meeting, the iXML 1.0 Specification was developed, drawn up and published by Mark Gilbert of Gallery UK at http://www.ixml.info. The iXML Specification is maintained by Gallery UK, and changes made are based on discussions by the iXML committee. Final Cut first supported iXML in FCP 6.02 in 2007. This support was extended to FCP X in version 10.3. HOW DOES THIS WORK IN THE FIELD? “I’m a cameraman who on occasion will handle audio. It is something I like to do because it allows me to see how other folks work. About 18 months ago this job came from another cameraman that I work with. In the beginning the scope was simple ENG following various teams. It grew to be much more. “The job required: Several EFP crews shooting team interviews and B-roll. The “In-bag” recording of isolated microphone sources and a Composite Mono mix. The mix sent via a wireless hop to the cameras. Time code generated in the bag and jammed to the cameras throughout the day. “This was more than I was expecting so the rental of a Sound Devices 633 was necessary. It wasn’t a super crazy reality show so the audio needs were fairly standard. A couple of wireless lavs, stick mic, and Boom. The 633 was perfect for this setup. “The production team came up with a filename, which we setup at the beginning of each day. I entered the names for each channel in the 633 before the production began. I choose the order of the channels based on the use of each channel. This was a boom heavy job so I set the boom to the first pot, lav, then stick on the third. “It was very cool to have all of the named isolated channels and separate recording of the mix down to two channels all in one file. Then to see the setup in FCP with Roles sucking all that info in is just incredible. “As you look at the names in the file, mixL and mixR provided a two channel mix to 1 and 2, like you would to a camera. So for instance lav would go to mixL and Lavstick and Boom would go to mixR. Each was used as needed. HOW DO YOU USE THIS IN FINAL CUT PRO X? Actually, this is really easy from an editor’s point of view. For this to work, the sound recordist on set needs to properly label the audio channels on their field recorder during production and you need to be running Final Cut Pro X v10.3 or later. NOTE: If the files were not properly labeled during production, you can assign Roles to each channel to obtain similar results. More on this below. When importing an audio file using the Media Import window, look on the right side and be sure to check Assign iXML track names if available. NOTE: Leaving this setting on when you don’t have iXML data does not hurt anything. Here’s an example iXML file (courtesy of Jon Gay). 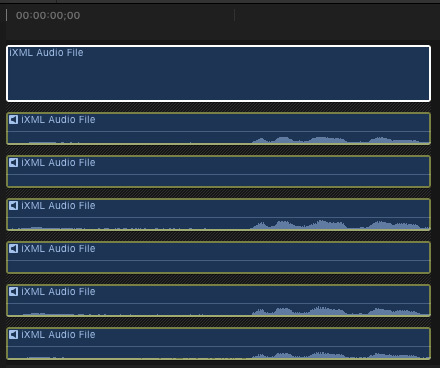 It looks like any other file in the Media Import window – except when you look at the Audio Output Channels. In this case, the audio file has six channels. NOTE: Some field recorders today can record up to 24 channels, and more. This makes labeling channels essential to stay organized and figure out who’s speaking. Select the audio clip in either the Browser or the Timeline and look in Inspector > Audio. At the bottom of the Inspector is Audio Configuration. 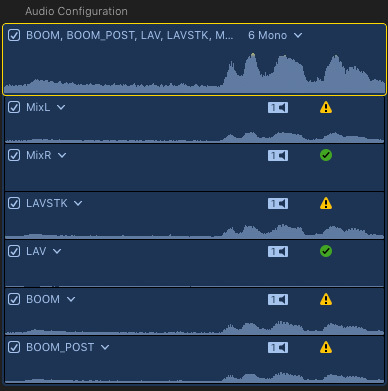 Expand the clip and every channel is labeled automatically based on what the sound recordist entered during production. Depending upon your recorder, the mixL and mixR settings may be defaults. To view the individual channels of a clip in the Timeline, select the clip and choose Clip > Expand Audio Components. This allows you to adjust the level, trim or mute each individual channel. Very cool – and thanks, Jon, for sharing this with us!! EXTRA CREDIT: WHAT IF THERE IS NO LABEL? 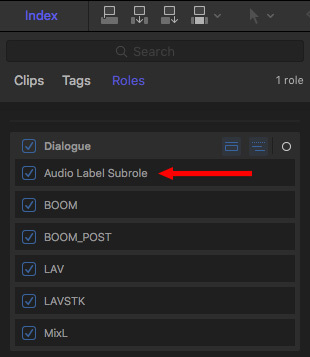 If there is no label, or the labels are wrong, you can assign roles or subroles to each channel to create your own labels. The easiest way to do this is in the Browser before editing starts. Here’s an article that describes Roles in more detail. For anyone who doesn’t have the $$$$ needed to purchase SD633, the Zoom F4 has comparable pre-amps + S/N ratio and records 4 channels that support iXML in BWF for less than $700.